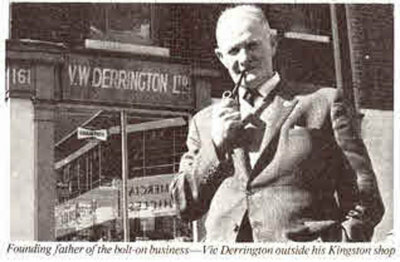 Victor Derrington first started making steering wheels in the early 1950s and applied for a patent on his wood rimmed model in 1954. There is evidence that he may have started with a leather rimmed wheel or made them at or around the same time as the wood rimmed wheels. customer choice, or with alternating color laminates as original. 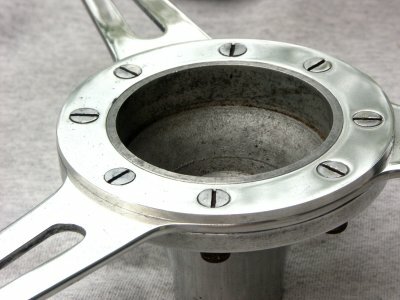 I make both the early eight bolt mounting and the more common nine bolt. 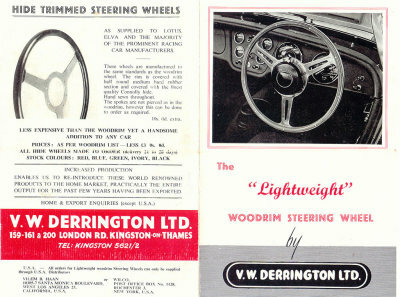 The Victor Derrington steering wheel was made using a multi-layered laminate of mahogany and obeechi (obeche) or white maple. This made for a beautiful rim with contrasting colors. While others copied this design, they often fell short with the quality of the wood, sometimes using just a marine plywood. Still, even with an original Derrington rim, the colors were sometimes compromised by the very nature of a ply laminate construction. Laminates of this type were constructed with veneers laid with the grain direction running perpendicular to the one below it. This approach displays end grain around a significant portion of the rim, reducing the beauty of both the grain and color. This is particularly troublesome today when the wood has had its colors muddled from age and exposure. 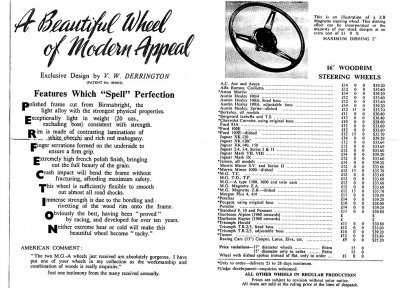 Whether re-wooding an original Derrington steering wheel or creating a whole new replica, a Lempert Derrington style laminate rim is made to a higher level. 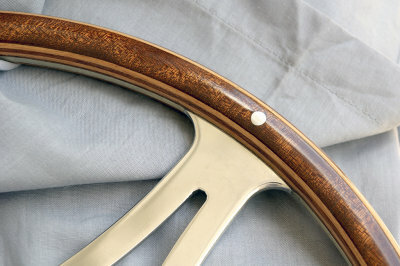 We have developed a process that, while more complex and labor intensive than a simple plywood, results in a spectacularly beautiful rim without the downside of a typical laminate. All layers of a Lempert laminate rim are cut from bent wood wrappings, resulting in the grain always appearing the same all the way around the perimeter of the rim. We start with two wood wrappings; one mahogany and one beech, then slice the rings into thick veneers. The veneers are then surfaced to precise thicknesses and the two types of woods are then laminated in alternating fashion. The last layer, the top of both front and rear are then applied using a select mahogany cut very precisely to expose beautiful ray flake grain. This advertisement shows all the cars that had wheel/boss combinations available. Also note that 16" was the standard with 15" and 17" as special order. 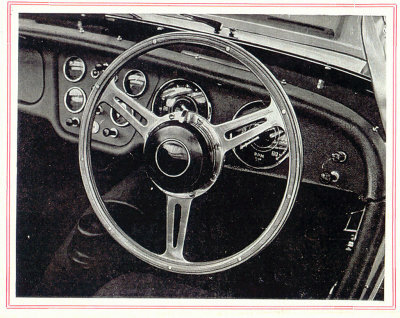 This advertisement shows the leather rimmed option and also clearly displays a wheel showing the unique 8-bolt mounting pattern. This close-up picture from a Derrington brochure shows how the mahogany and obeechi layers contrasted, as well as again displaying the 8-bolt mounting pattern. 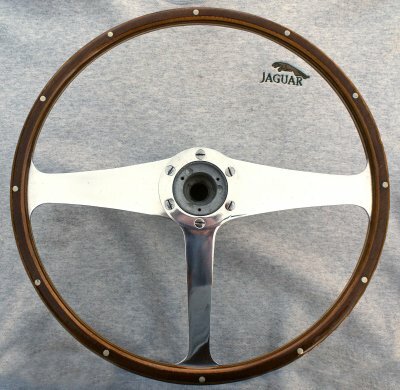 This original Derrington Jaguar MK 2 steering wheel is an example of a 17" with different spoke design made just for that Jaguar. These wheels were only made in 17" size. Some had two additional holes to left and right of center to couple with the horn ring assembly. 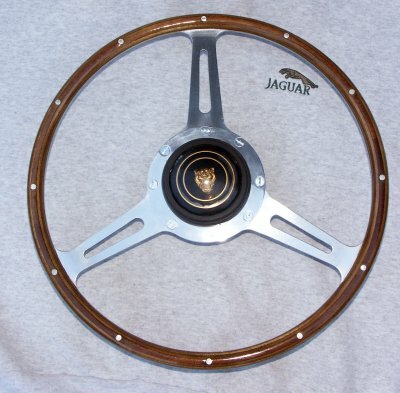 This original Derrington was a special order 17" version for XK140-150. While well preserved, note how the lighter color obeechi has become darker over time and no longer gives the wonderful contrasting look. This close-up picture shows the muddled colors from the exposure to light over decades of time. 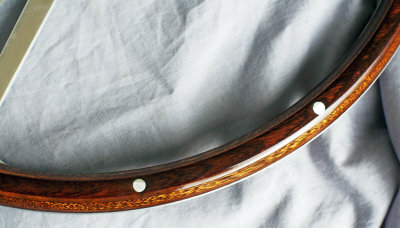 While the mahogany is a rich, dark red color, the obeechi has also darkened.